I have been teaching English and German for about 20 years and I still love it. I am glad there are people like Victor who created such a MAGIC SITE!I wish there were such a site for German! 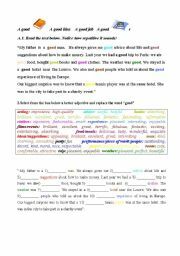 Most syllabus offer more grammar than vocabulary exercises, therefore I try to make a vocabulary worksheet for most topics according to the needs. 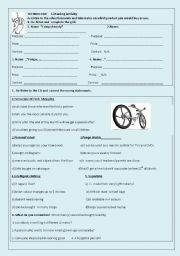 Many of my worksheets have easier and more difficult activities due to our mixed ability classes. 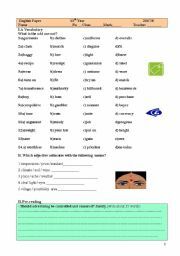 Just a worksheet to practise the above verb tenses/expressions. I hope it´s useful! One of the test I used last year for the 11th year related to getting a part time, the Gap Year and the "Job for Life". 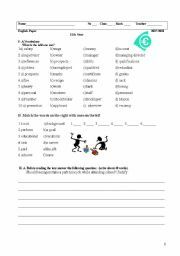 It tests reading comprehension, vocabulary, relative pronouns, if-clauses,reported speech, double comparative, collocations and linking words.Check its usefulness! I have thought about doing this as my pupils tend to use "good" and "bad" for everything. Let´s hope they become aware of the effect of repeating good all the time and that they start replacing it by other adjectives. Key for activities B+C included. If you find any mistake, please let me know!Thanks! Useful to introduce the topic space. Pupils label the pictures. Enjoy! 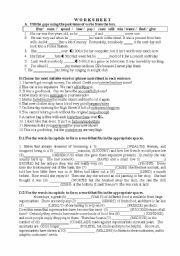 A written test I used last year related to the above topic. 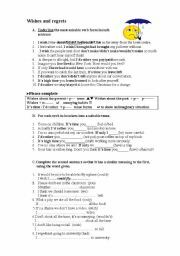 There are other exercises like: gap-filling (verb tenses), rephrasing (conditionals, purpose clauses and reported speech.Hope it´s useful! 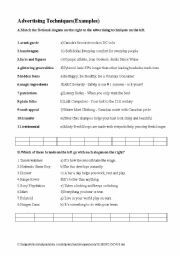 As my pupils love drawing and they had to make an aural project on topic Technology, I created this listening worksheet so that they could feel more confident about the presentation a future gadget (mentioning: name, price, colour and other features-like the examples they heard.If you want the tape script, please e-mail me. Hope you like it! .